Curio Inc, based in Gifu City, and Daido University have jointly developed a foldable electric wheelchair. The mass of the wheelchair, Scoo, is about 30 kg, which is about 1/3 that of products developed by other companies. And it can be easily brought onto a train, airplane, etc. Its price is ¥380,000. By folding (1) the operation handle located on one side of the wheelchair, (2) seat and (3) armrests, in 10 seconds, the wheelchair can be transformed into a different shape so that it can be carried like a carry case. When folded, the wheelchair measures 890 (L) x 530 (W) x 350mm (H). It can be vertically stored in a space with a width of about 400mm. It is difficult to bring electric wheelchairs in the cargo compartment of an airplane because of the capacity of their batteries. Electric vehicles cannot be stored in the cargo compartment as they are; their batteries need to be detached and brought in the passenger cabin. However, the battery capacity of existing electric wheelchairs exceeds 300Wh, which is the upper limit of the capacity of a battery that can be brought in a passenger cabin. This time, by reducing the weight of the vehicle, Curio realized an electric wheelchair whose traveling performance does not lower even when the battery capacity is lowered to 276Wh. 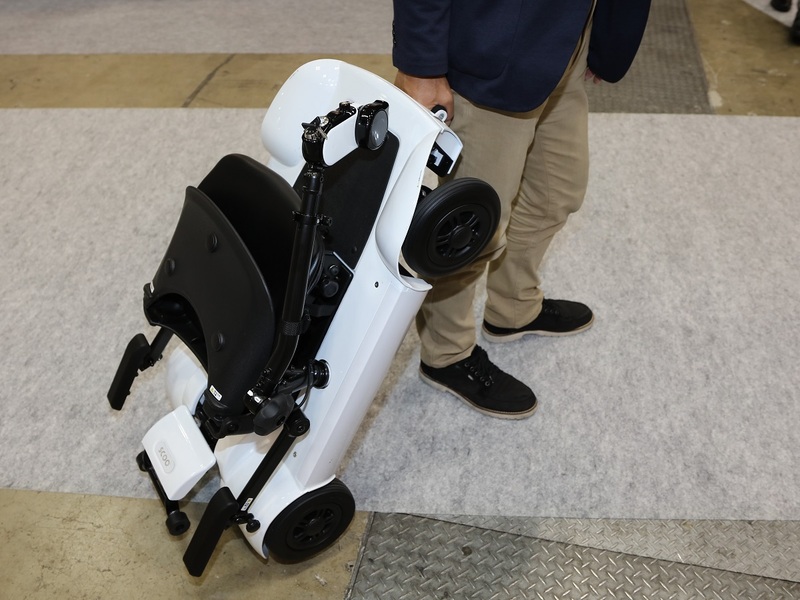 As a result, the detached battery of the new wheelchair can be brought in the passenger cabin, and the folded wheelchair can be stored in the cargo compartment. The battery is located in the central part of the chassis. It can be charged in about two hours. And the electric wheelchair can travel 16 km per charge. The rated output of the motor, which is located near the rear wheels, is 80W. The electric wheelchair is a rear-wheel-drive vehicle. Differential gears are used to transmit power. And its front wheels are used for steering. "The structure of the chassis is almost the same as the structure of an electric vehicle (EV)," Curio said. Because of the light weight of the vehicle, the company was able to employ a compact motor with a low output. The maximum speed of the electric wheelchair is 5.5km/h, which is equivalent to the speed of a human walking briskly. As an operation handle, Curio employed a mechanical type instead of a joystick, which is frequently used for electric wheelchairs. When the handle is swung to the right or left, the front wheels move in the same direction. When a circular lever is tilted forward and backward, the wheelchair moves forward and backward, respectively. "It enables us to easily have a sense of how much the vehicle turns," said Takashi Ifuji, professor of the Faculty of Engineering and Design at Kagawa University, who helped the development of the electric wheelchair. So, the mechanical handle can shorten the time it takes to get accustomed to the operations and can prevent misoperations after getting used to the operations. Responding to a wide range of demands, Curio also released a new model equipped with a handle that is operated by both hands. The size of the wheel is 7 inches, but the company is developing a model that has 9-inch wheels and can more easily run on rough roads, aiming to launch it in 2019 or later. It's all cool until someone smuggles bottled water inside their wheelchair. Yay. something else to add to the waiting time to go through security. Looks interesting though I wonder a bit about it's stability for day to day usage. Perhaps it's something that Airports could buy for use by passengers once through passport control ? That and your therapy dog would be a lot to handle.